Pharm. 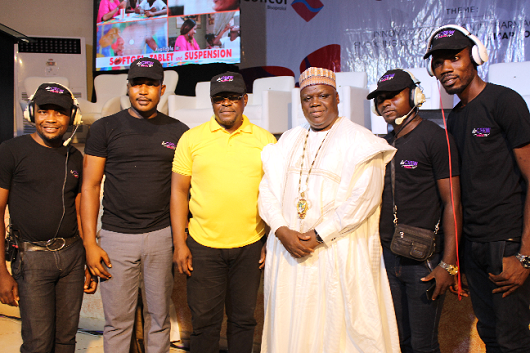 Ahmed Yakasai, immediate past president of the Pharmaceutical Society of Nigeria (PSN) has praised Decrew Media for its coverage of the 91st annual national conference of the Society, describing the team’s performance as exceptional. Speaking during the conference held at the International Conference Centre, Ibadan, Oyo State, Yakasai stated that the Decrew team, led by Pharm. Kabiru Raji, had helped to ensure that all friends of Pharmacy and the PSN who were desirous of following proceedings at the conference were able to participate in the event because it was broadcasted live online for the world to see. Pharm. Ahmed Yakasai, president, PSN (3rd from right); Pharm. Kabiru Raji, team leader, Decrew Media(3rd from left) flanked by some of the officials of Decrew Media during the conference. The PSN helmsman noted that though Decrew’s first live streaming coverage of PSN annual national conference was first done in 2017 in Umuahia, Abia State, the 2018 coverage showed that the team had improved tremendously in the last one year, adding that the live streaming of the annual pharmacy conference, one of the innovations introduced during his tenure as PSN president, had now become a key feature of the event. He stated further that with his knowledge of the modern digital world, he was proud to say that the services of the Decrew’s team were world class in quality, noting that he could recommend the Pharm. Raji-led team to anyone in need of live streaming coverage of their event without reservation. Speaking with Pharmanews at the conference, Raji said he was excited to beam the PSN conference live online, noting that though it was a highly technical exercise, it was possible because of the high tech equipment the team had and the dedication of the crew members. He stated further that the trend worldwide right now is that important conferences are streamed live to ensure that people who are not at the conference can follow the event if they so wish, adding that PSN, being the oldest professional body in Nigeria, was not only following the global trend but setting the right pace for other professional groups in the country to follow. He thanked Pharm. Yakasai for his support and understanding, noting that the cooperation of the PSN helmsman was of great help to his team as they tackled the challenges they faced in the course of the assignment.